Spas & Hot Tubs. HAYWARD 6-WAY 2 FIP BLACK, TOP MOUNT-(SP071621). Hayward’s Vari-Flo XL multiport control valve, made of our exclusive Permaglass XL material and engineered for maximum flow at lower pressure drops is the choice in multiport valves. It will retrofit any filter that has an SP071113 valve that needs replacement and upgrading. All Vari-Flo control valves feature an easy-to-use lever action handle that lets you “dial” up to seven valve/filter functions: filter, backwash, waste rinse, closed, winter or recirculate. Complete with an integral sight glass that lets you see when the backwashing cycle is completed, our wide selection of valve configurations allows you to match the right Vari-Flo valve to the proper applicaiton; residential, commercial, top-mount or side mount. Vari-Flo Control Valve Functions. Filter -For normal filtering and regular vacuuming. Backwash -For cleaning filter sand bed of accumulated debris. Rinse -Use after completing backwash cycle to ensure all dirty water is rinsed out of the filter to waste. Waste -By-passes the filter for draining or lowering pool water level and for vacuuming heavy debris directly to waste line. 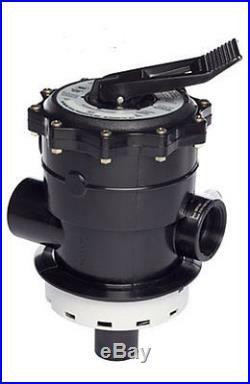 Recirculate -Water is recirculated through the valve, by-passing the filter. Closed -Shuts off the flow from the pump to the filter. Winter -For winterizing (SP0714T only). Customers who have shopped with us before can tell you. Specialty Pool Products. Offers the finest, most innovative and most effective items for your pool, spa, backyard and home. We only sell products that meet our strict standards for quality, function and value. And there’s more… Specialty Pool Products also promises you. We are unable to make changes or cancellations to orders after they are placed. Oversized deliveries are curbside only with FREE Lift Gate Service. If the combined weight of your order is 500 lbs. At SPP, your satisfaction is always our primary concern. Ready to order, need help or have questions? During peak times our response may be delayed as we do receive hundreds of emails daily. If you are in need of immediate assistance please call, our reps are available during the hours shown above on our banner. We hold ourselves to the highest standards and value the trust you place in us. We pledge not to share this information with other organizations for commercial purposes. Specialty Pool Products does not rent or sell its customer list. The item “Hayward SP071621 Top Mount 6-Way 2 Pool Sand Filter Valve Fits S270T or S310T” is in sale since Thursday, January 26, 2017. This item is in the category “Home & Garden\Yard, Garden & Outdoor Living\Pools & Spas\Pool Equipment & Parts\Pool Filters”. The seller is “poolproducts.com” and is located in United States. This item can be shipped to United States. This entry was posted on Tuesday, January 31st, 2017 at 9:48 pm	and is filed under hayward. You can follow any responses to this entry through the RSS 2.0 feed. Both comments and pings are currently closed.